Student Lives in Crisis: Deepening Inequality in Times of Austerity. Lorenza Antonucci. Policy Press. 2016. 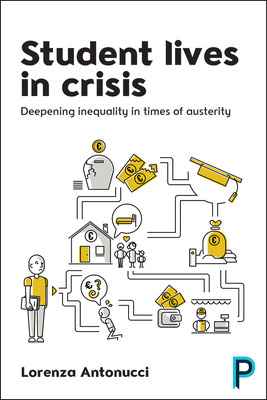 Lorenza Antonucci’s Student Lives in Crisis: Deepening Inequality in Times of Austerity is a stimulating account of the material inequality that young people across Europe face during their time in Higher Education. Antonucci compares the welfare provision of three countries – Sweden, England and Italy – to explore how the type of state support available to university students impacts levels of inequality. The overall argument of Student Lives in Crisis is that rather than aiding social mobility, experiences of university have a tendency to reinforce existing inequalities between young people, but that it does not have to be this way. Part One of Student Lives in Crisis explores the differences in state financial provision for university students across Sweden, England and Italy. These countries were chosen to represent a mix of different university welfare regimes: generous and universal in Sweden; mixed state and private financial support and means testing in England; and the low and highly residual state support available in Italy. Antonucci demonstrates that austerity policies spread across the EU have led to less state spending on Higher Education and provision of support for university students: even in Sweden, working-class students are increasingly relying upon paid employment to supplement state support. This, Antonucci argues, is part of an EU trend towards the ‘privatisation of social risk’ (34) of Higher Education, whereby young people are expected to find the money to fund increasingly larger parts of their university fees and living costs. This is done through three primary sources: taking on large debts, relying upon family support and entering paid employment. Antonucci argues that ‘where young people come from, in terms of the class and their location, does have an impact on their experiences of university’ (54), and that in both England and Italy, the state’s assumption that parental support will be available for students reinforces levels of inequality between young people. It is in Part Two that Antonucci introduces her empirical research, which consists of questionnaires and interviews with students across the three countries. In Chapter Five, Antonucci talks the reader through the five ‘ideal type’ profiles that she has developed from her research to represent students from a range of socioeconomic backgrounds and welfare mixes. The profiles consider information across four key themes – finance, housing, wellbeing and education – and are designed to demonstrate the varied experiences that young people have at university. At one extreme, we have the profile ‘struggling and hopeless’, whereby young people have precarious financial situations, negative housing experiences and little hope for the future. In contrast, at the other end, the profile ‘having a great time’ represents young people with excellent housing conditions, good finances and who are generally having an excellent experience of university. Each of the five profiles is described in detail throughout Chapter Five, and Antonucci makes use of interview extracts to add a depth and personal touch to the research that I found particularly fascinating. In Part Three, Antonucci explores the three forms of financial support available to university students in more detail: family support, paid employment and state support. She argues that ‘the way young people have to rely on family and labour market sources to fund their university experiences creates one of the most pervasive mechanisms of the reproduction of inequalities’ (161). I found the discussion of university students and their need to rely upon labour market sources of income of particular interest. Antonucci highlights that the labour market only furthers inequalities between those from low socioeconomic backgrounds and those from intermediate and high socioeconomic backgrounds. Those who cannot depend upon state or family support are facing precarious work with little choice afforded to them. In contrast, those who can comfortably depend on state and family support are able to ‘cherry-pick qualified unpaid experience in the labour market, which will allow them to compete more effectively in the labour market after university’ (161). In other words, those who have to work end up in low-paid, precarious employment which contributes to their income but does not provide relevant graduate experience, whilst their peers may be undertaking internships and placements at graduate companies. This is particularly pertinent for deepening inequalities after university as Antonucci asserts the ‘under-employment and youth graduate unemployment are a common experience’ within the graduate labour market (163). ‘considering the importance that HE plays in European societies, it would be a destructive policy choice to maintain only the facade of open systems of HE, which masks the existing reality that causes universities to reinforce inequalities’ (170). If policymakers truly care about addressing inequality amongst young people, for Antonucci the answer is simple – providing generous and universal state support for all university students can somewhat overcome some of the inequalities between those from different socioeconomic backgrounds and will help make students’ material experiences of university less varied because of their class background. Student Lives in Crisis is an eye-opening account of the material inequalities that young people face whilst at university, but reassuringly Antonucci highlights that university does not need to reproduce inequality if policymakers choose to abandon austerity policies and offer generous universal support for all students. However, whether that will happen remains to be seen. Student Lives in Crisis should be read by anyone interested in Higher Education policies in Europe, young people’s transitions and those researching inequality and social mobility more generally. Heather Mew is a masters graduate from Durham University whose research interests are around the themes of class inequality, stigmatisation and resistance to austerity and governmentality. She is currently in the process of developing PhD applications, and tweets at @heatylouise. Read more by Heather Mew.